Ex-pats who will be voting in the US Election, clockwise from top left, Laura Leath, Barbara Hughes and her son Michael, Martin Nelis and Pauline Curran and husband. Hundreds of people originally from Derry will cast their vote in the US Presidential Election on Tuesday. 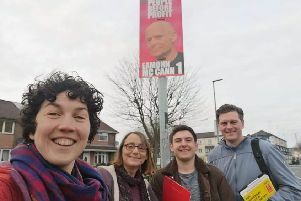 This election has been described as one of the most gripping of modern times and although they might be relatively small in numbers, Derry people will have their say. We spoke to several people originally from Derry but who are now living in the USA. All of the people interviewed told us who they are voting for and why. “I grew up in the Bogside and I am from a big family of eight. “My mum was widow at a young age and raised eight children on her own. I left home when I was 19 to get away from the Troubles and came to America while I was back packing around the world. “While I was in America they had a lottery for Irish for green cards,I applied and was lucky enough to have been chosen in the lottery - that was 27 years ago. “I live in San Francisco and I own my own business called ‘Shear Irish Hair Salon’. I married a guy from here and I love it here but wish I didn’t live so far away from family and Ireland. “I’m voting for Hillary Clinton because at least with Hillary we know what we are getting. Donald Trump seems to be a bully and treats women awful - also he keeps saying he is going to make America great again but doesn’t back it up with any plans on how he will do that. Trump scares me as he seems like a time bomb, also he seems like he doesn’t like emigrants which is what America is founded on. Pauline Curran pictured with her husband. “I talk to a lot of people in my shop on a daily business and most people I talked to are unhappy we don’t have better candidates to chose from. “I moved to the USA from the Waterside in Derry more than 20 years ago - I came here for the work. Barbara Hughes and her son Michael. “I have worked in construction all of my life and I have seen, first hand, how illegal immigration can impact on people who are here legally. “A lot of the Mexican workers who come over the border manage to get work because they are prepared to do the job for much less pay. “I grew up on Lawrence Hill in Derry - I left Derry in 1989 for England. “I arrived in Seattle in November 2004, the day before George W. Bush got elected for the second time, or didn’t get elected, depending on your view of events. “My husband accepted a job with Boeing, and with our one year-old son we moved from Italy to the USA. We intended to stay for a year and 12 years later, we are still here. We received green cards in 2006, and when they were up for renewal this year, we decided it was time to apply for citizenship. “My inspiration for applying was sparked by a local issue - my inability to vote on a recent school bond. Our neighbourhood school was overcrowded and in disrepair, and my community proposed a tax levy to build a new facility. Frustratingly, nearly 18% of parents with children in our school district could not vote for the initiative because, like our family, they are here on H1B visas to work at Boeing, Google or Microsoft. We live here, pay taxes here, our kids are educated here and we rely on the health service and social infrastructure here. My husband and I decided that our family needs to have a voice in the decisions being made. “The fact that this is a presidential election year made applying for citizenship an even easier choice. “I am a Democrat. I have always been slightly left of centre, I believe in social and economic equality for all. I do not believe religion has a place in politics and as Whitney put it, I believe children are our future. Great education and health care are the foundation to a successful society. I believe we need to have more rigorous gun control in this country and that Global Warming needs to be addressed. I believe that we need Immigration reform and Tax loopholes need to be closed, so that huge corporations pay their share. “When I heard the news that Trump was the Republican nominee, I was incredulous. It must be some kind of reality show, a joke – to somehow make a point? This caricature of a man, with his childish outbursts, fake tan and confusing hair? Really? He is inexperienced, inarticulate, sexist, racist, short-tempered, a tax-evading inciter of violence and hatred. The image of him mocking the journalist with the congenital hand defect? That, alone, should have disqualified him from the running. The audio of him bragging about grabbing and kissing women? His repeated insults to women, immigrants, Mexicans, veterans... the list is endless. It seemed for a while there, that every morning I would wake up, read about his latest appalling act or speech, and the country’s level of acceptance would sink even lower. “I watched two of the debates at home with my sons. At 13 and nine, my boys are held to a higher expectation of behaviour than Trump was. His constant interruptions, his “nasty women” interjection, the inability to formulate a coherent sentence. It was horrifying. I work hard to instil strong values in my children. I have brought them up to be honest, I expect them to be respectful and compassionate. Watching the debates with them, I was struck that here was a candidate, vying to be President of America, potential leader of the Free World, demonstrating all the qualities I abhor in society today. Dishonesty, disrespect, a racist bully. What message was this giving my children? That this behaviour is acceptable? To be applauded? “Hillary is a Progressive. She has over thirty years’ experience, working in Public Service. She has a proven track record. She has been Secretary of State, a US Senator and the First Lady. She is a lifelong advocate for women and families. She is an advocate for Planned Parenthood, she is for Marriage Equality and she believes in Climate Change and has plans to address it. She will take on the Gun Lobby and fight for common sense reforms such as comprehensive background checks and closing loopholes. She will address the tax laws that allow huge corporations to pay less tax than the middle class taxpayers. She is passionate about education and will address the crippling student debt issues that face graduates. “I grew up in Kilfennan and went to Oakgrove Primary and Secondary. I live and work in Bakersfield, California, about 100 miles north of L.A. I am a Public Defender, which means I represent people who are charged with crimes and who can’t afford to retain an attorney. “I work with some of the most vulnerable people in society – people who are homeless, people who have mental health problems, people who have issues with addiction - and I see the effect that national and local political decisions have on their lives and on the lives of their children. I will be proudly voting for Hillary on Tuesday. “Donald Trump is not just the worst presidential candidate of the 2016 election, he is the worst presidential candidate of my lifetime. He insults women, people with disabilities, LGBT people, immigrants, Muslims, basically anyone who isn’t a straight white male. He’s an immoral bully. He talks openly about his admiration for dictators, boasts about short changing small businesses, encourages espionage against opponents, incites public violence and is still talking about building that stupid wall. “I’m not just voting for Hillary because I’m scared of the horror show that would be a Trump Presidency. I’m voting for her because as Barack Obama correctly stated: there has never been a man or a woman more qualified than Hillary Clinton to serve as president of the United States of America. “I want a president who’s spent her life in public service, who does her homework, who’s been battling for everyone’s right to health care since I was in primary school, who isn’t afraid to support women’s autonomy over their own bodies, and who supports equality – race, gender and sexuality. I want a president who has read, understands and respects the constitution. “My family used to live in Westland Avenue in the Bogside and all of them are still living in Derry or surrounding area, except me, of course. My mother is Mary Nelis who is quite well known in Derry. I’ve been in the San Francisco Bay Area region of California for the most part since 1990 when I married an American. I have three children aged 22, 19 and 17 (Aidan, Fiona and Deirdre respectively). “I live and work in a city called Pleasant Hill, population 34,000, which is a suburb in the East Bay of San Francisco. I am the Public Information Officer for the City of Pleasant Hill. “The election - where do you start? I have already voted for Hillary Clinton as an absentee (mail in) voter, as many people do here. In the primary elections, I was a strong supporter of Bernie Sanders whose views and policies I most closely identify with. “There is a clear choice in this election. Trump represents the politics of hate, fear and division. His actions and statements are that of a fascist, albeit a dumbed down one, and there many other adjectives you could use to describe him. “While I have strong reservations about Clinton’s foreign policies, specifically her pandering to Israel and propensity to support the bloated military budget, there is no other real choice in this election. US voters need to reject Trump loudly and clearly and Clinton needs a mandate of sorts in order to fend off anticipated republican obstructionism should she be elected. “The US Supreme Court wields enormous power and its decisions affect the daily lives of millions of Americans. If, for no other reason than to have the right nominations to this body, the choice for President is critical. It doesn’t bear thinking about the consequences of a Trump victory - many of us are literally petrified of the thought of it.